Can anyone let me know what some or all of the entries on my Granfathers record mean please.? He was transferred to the RFC as a wireless operator from where I don’t know. It’s the various bits of written notes I am interested in on various parts of the record. BEF i know is British Expeditionary Force and 53sqd is 53 squadron. Thanks for any help. Pete. Hi yes it was me. A chap suggested that I put the enquiry on the AIR section to see if I get info. Thanks for your help. Pete. 1 WS is no 1 Wireless School which at the time was based at Blenheim Barracks, South Farnborough. 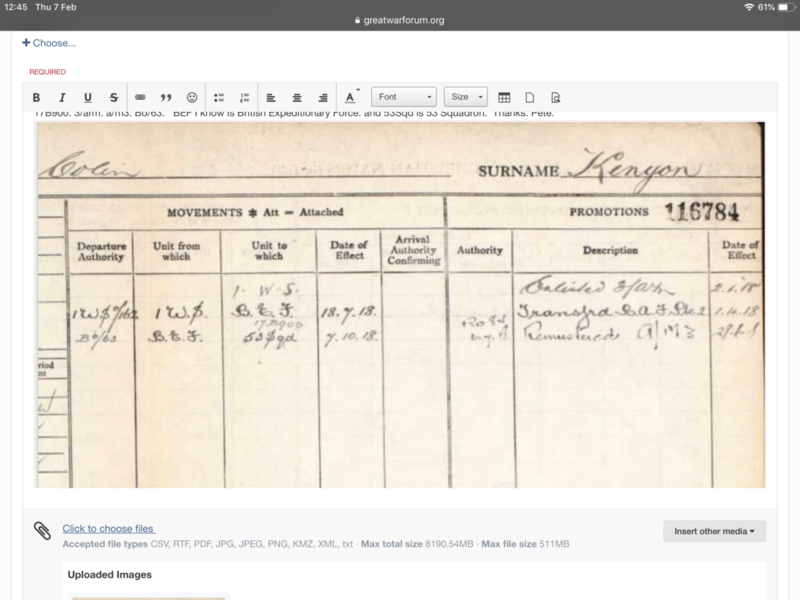 The transfer in that record is the change from RFC to RAF on 1 April 1918. Do you have any indication of prior service in another organization/regiment? If not, it's likely he enlisted in the RFC. Hi Buffnut453. Thanks for reply. He was, I believe a despatch rider earlier in the war but no service record has survived. I do however have photos of my Grandfather in uniform and posted them sometime ago on the forum site. 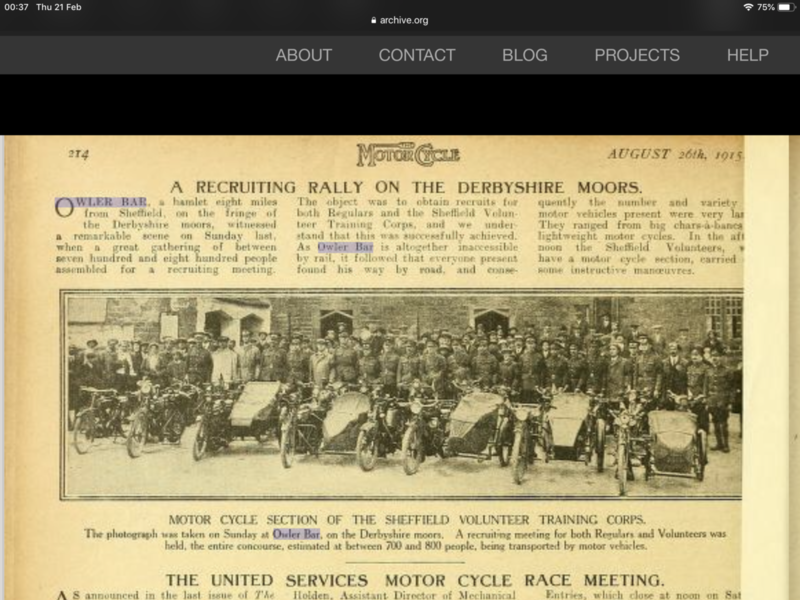 In which case he may have been recruited through - or had his name published as enlisted - the Motor Cycle Magazine. This can be accessed free online. Sometimes includes photographs. Links for available online volumes may be accessed here. Archive.org. Wow ! A lot of stuff on that Motor Cycle Magazine site. Very interesting. The 2 pics attached were taken from the magazine and are where my grandfather is pictured on some photos I posted some time ago on this site asking for info. My photos can be seen on my site Petehils under RFC despatch riders. 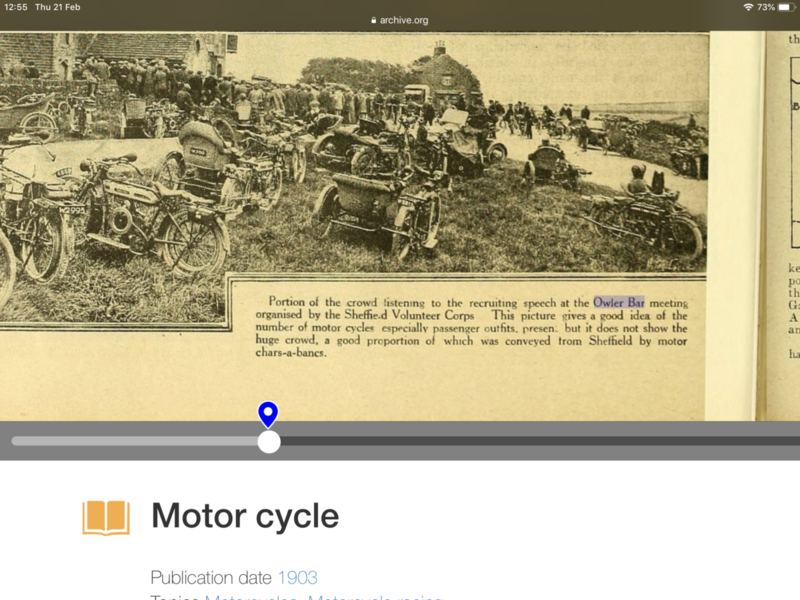 Pete - glad the link to The Motor Cycle was useful. Could you post a link to your Petehils site. I`m struggling to find it. Hi. If you click on the members list at top of page and enter petehils my posts come up. (hopefully) Pete.